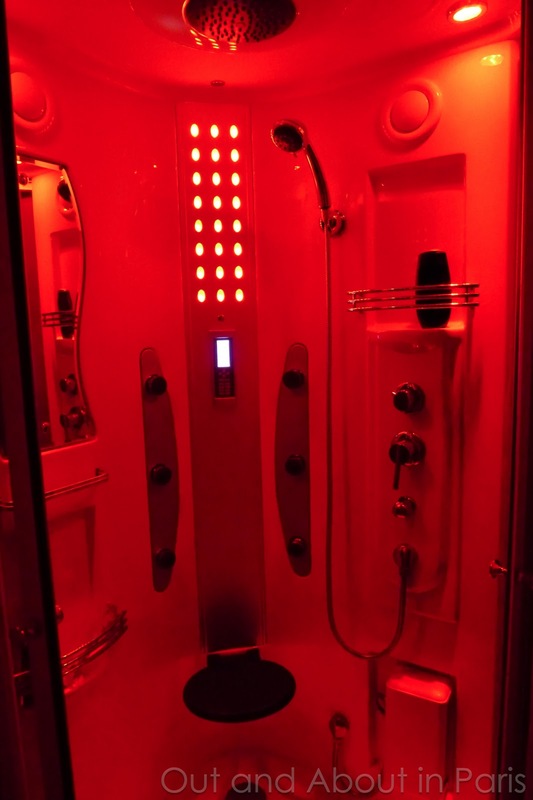 While the view of the Eiffel Tower from our balcony is a big plus for a home exchange, I think that it would be more difficult to resist our disco shower (see below). Ph: So, have you booked a room yet? MK: No, but I'm going to start looking this week. Ph: That's good cuz Stefan's (one of his three roommates) parents haven't been able to find anything. MK: Well, if we don't find anything, Dad and I'll just stay at your apartment. Ph: (Nervous laughter) Well, ah, yeah. Or maybe you could sleep at Sara's (his sister's) place. MK: Sara doesn't have enough space. We'll just have to stay in your room and Stefan's parents can have his room. You said that we'd like them, so this will give us a good chance to bond. Ph: (More nervous laughter as he imagines me sharing embarrassing childhood stories about him with Stefan's mom at 8 o'clock in the morning). Yeah, right. Well, you should really start looking for something. What I didn't tell Philippe is that he shouldn't worry because there's no way that I want to stay in an apartment with 4 guys in their early twenties - I just like watching him squirm! Plus, after years of reminding him to do this or that, it feels good to be the slacker for a change. So, instead of exploring Paris, I've been perusing listings for Boston on HomeExchange. While many people don't like the idea of strangers staying in their home, I think that it's a great concept. In the past couple of days, I've exchanged emails with people who are excited by the prospect of living like a local in Paris, just as I am at the thought of exploring their neighborhoods. Intrigued by the idea of doing a home exchange but still not sure if it's for you? The Holiday with Kate Winslett and Cameron Diaz may convince you. If your schedule is flexible, it's a wonderful way to travel. Our 5 most recent offers have come from people in England, California, South Carolina, Quebec and Florida. 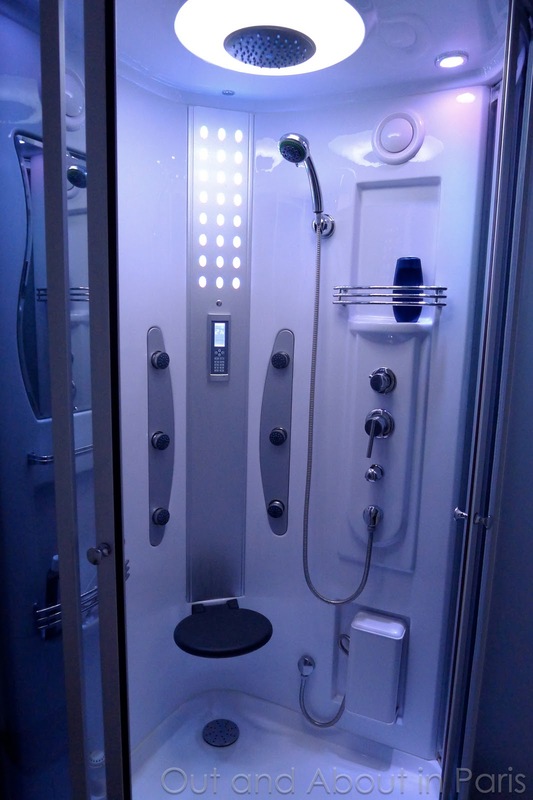 Our disco shower/sauna comes equipped with a radio, a mirror, a seat, alternating colors and multiple jets to wash every inch of your body. Philippe took these photos to send to his girlfriend while visiting in December. I don't even want to know why! OMG! Is this really your bathroom? Amaaaazing!!! I think I would need instructions on how to use your shower and get the most out of the lighting. Wow. Wow. Wow. By the way, I love when you write out convos you had with your kids. They make me laugh so much! I know - it's crazy! Unfortunately, the disco shower's instructions are nowhere to be found. It's the shower that Stephane uses and it took him a couple of days to even figure out how to turn the thing on. My kids love it when I write about our convos, too! ;) I'm actually hoping that this post goes by unnoticed, otherwise it may be heavily censored! That disco shower is to die for! But seriously, should you and Stephane get stuck in securing an exchange, let us know. We now have a proper spare bedroom, and would be delighted to host you for Phillippe's graduation weekend. No twenty somethings to contend with, but Otis may insist upon a few games of "tug" with his favorite toy! The bad thing about the disco shower is that Stephane used to crank up the volume on the radio extra loud so that he could hear it over the splashing water at 6:00 am. I'm sure that our neighbors wondered what was going on! Many thanks for your very kind offer to stay with you, but I'm fairly optimistic that I'll be able to find an exchange. Playing "tug" with Otis would be a pleasure! You have the same exact shower as Seb's parents!! Why didn't you tell me that you ALSO have a disco shower?!? You're such a saucy minx! Wait a minute - you have met Seb's parents, right? I mean, is there any chance that our son is masquerading as Seb and that he actually sent the photos of our disco shower to you, his girlfriend! -- OK, I admit it, I've been watching too many movies with twisted plots, but it would be a funny way for you to find out that the "saucy minx" is Seb's mother. Since our disco shower came without instructions, I may have to ask you if we ever decide to use the sauna. Omg, could you imagine?! LOL...I was dating your son this entire time!! Ahahahahaha!! I too have been watching too many movies with twisted plots (Lifetime Television for Women) and start thinking like this after the fourth movie. Email me the dates and I will see if my Uncle is interested. He has a great apt in Boston near Copley Square. Thanks, Nancy! I just sent an email to you with the dates. I don't believe that shower! So that's what life in Paris is like. I think home exchanging is a good idea. We met a New Zealand couple who have done it for about thirty years and never had a bad experience. We can't join in sadly - I think landing llamas, chickens, goats, alpacas, sheep, pigs on etc on visitors might be a bit much! 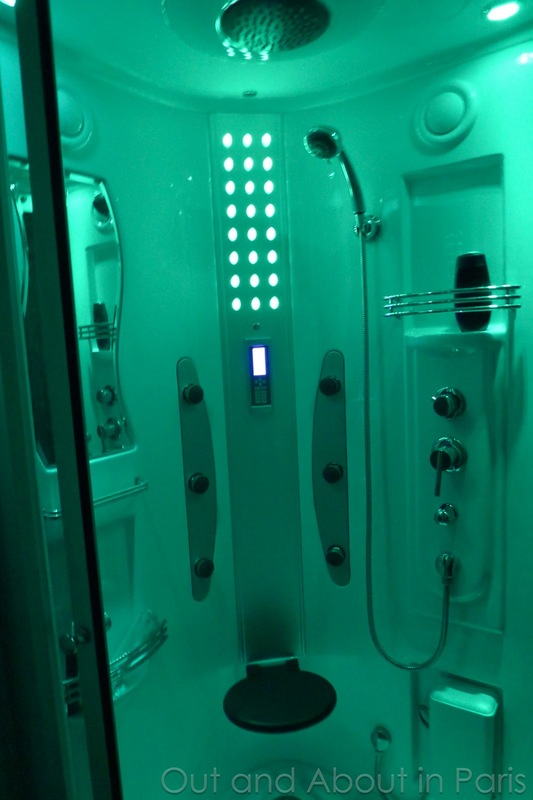 Yup - the disco shower is the perfect metaphor for the wild life that we live in Paris! All of these disco showers are probably the reason that it's known as the "City of Lights". Some of the exchanges that I've looked at include cats, but you're right that caring for your menagerie of animals would probably be slightly daunting to most people. Nice blog, thanks for sharing this... I will come to look for update. Keep up the good work. Thanks for posting a nice blog for ! Home Exchange Home Exchange .